This package includes the Enhanced Pearson eText and the print bound version. Lynne Díaz-Rico is Professor of Education at California State University, San Bernardino where she coordinates the MA in TESOL program. 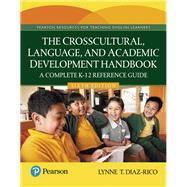 Her books, Course for Teaching English Learners, The Crosscultural, Language, and Academic Development Handbook and Strategies for Teaching English Learners are widely used in programs of teacher education to prepare teachers for culturally and linguistically diverse classrooms. She is a past president of CATESOL and a frequent presenter at CATESOL and TESOL conferences on topics of literacy and language development, intercultural communication, and innovative teaching methods.